The Pioneer PLX-1000 Analog DJ Turntable is a remarkable impressive and professional standard analog DJ Turntable that has been developed to provide everything you could require from a DJ turntable whether at a club festival or even for home. 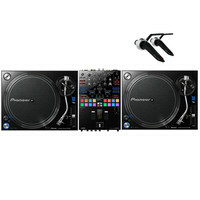 Also included is the Pioneer DJM-S9 2 channel scratch mixer for Serato DJ. The unit features two USB sound cards (lets two DJs play back-to-back seamlessly) plus inputs for analog equipment like turntables CDJs (RCA output) and a microphone. The build quality of the DJM-S9 is excellent and features Pioneers newest contactless magnetic crossfader. To finish off the bundle we have also added a pair of Ortofon Pro S DJ cartridges.